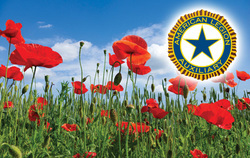 The American Legion Auxiliary's Poppy Program to benefit veterans and their families has been around for nearly a century, the program recently expanded to allow donations to assist active-duty military and their families as well! At the end of WWI, the American Legion adopted the poppy as a symbol of freedom and true blood sacrificed by troops in wartime. And now, not only the poppies made by veterans, Auxiliary members, and volunteers will be sold, the symbolic flower will appear on T-shirts, cookies, buttons, and a near endless array of items. All proceeds go to supporting visits to local veterans at home, nursing and VA facilities, but also in the "care packages" the Auxiliary sends overseas to our service members far from home. Your donations are most appreciated!